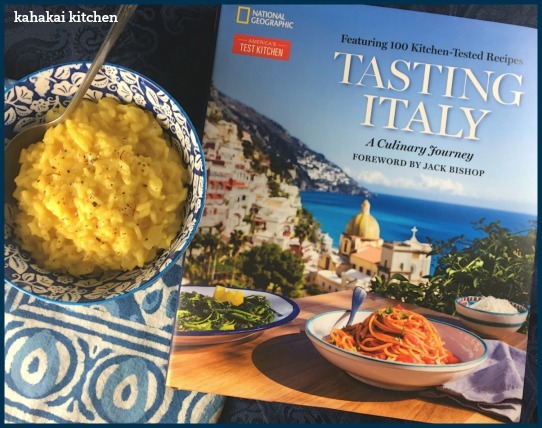 It's always a good day when I get a gorgeous cookbook to drool over and I am excited to be today's stop on the TLC Book Tour for Tasting Italy: A Culinary Journey from National Geographic with America's Test Kitchen. 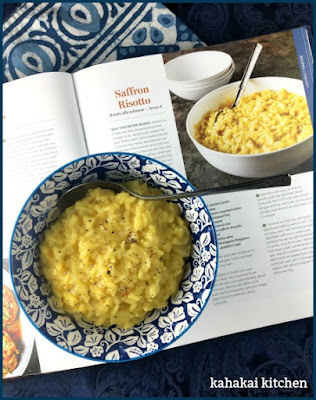 Accompanying my review is a recipe for a gorgeous and tasty Saffron Risotto from the book. Featuring 100 innovative, kitchen-tested recipes, 300 gorgeous color photographs, and 30 maps, this illustrated guide takes you on a captivating journey through the rich history of Italian cuisine, region by region. Rich excerpts feature the origins of celebrated cheeses, the nuances of different wine growing regions, the best farmer’s markets in Venice, and more. Intriguing prose illuminates key ingredients, from olive oil and how it’s made to the various pasta shapes of Northern Italy. In every region, the food experts at America’s Test Kitchen bring it all home, with foolproof recipes for standout dishes as well as hidden gems: Piedmontese braised beef in lustrous red wine sauce, crispy-custardy chickpea flour farinata pancakes from Genoa (achieved without the specialty pan and wood-burning oven), and hand-formed rustic malloreddus pasta of Sardinia that is a breeze to make. The combination of National Geographic and America's Test Kitchen make Tasting Italy much more than a cookbook. It's a travelogue celebrating the history of food in Italy through each of its regions and it is a big book and very beautiful. The 300 color photos and 30 maps show tempting food and gorgeous scenery, as well as illustrate the special ingredients, food grown or raised, historical facts, and stories about each area. I have only spent a few hours reading through it so far and I find myself beguiled by the beauty of Italy and its rich history and the interesting facts from pasta shapes to Italian cuisine influences and the origins of customs and recipes. With America's Test Kitchen involved, you know that each of the 100 recipes included have been fully vetted in the kitchen and each recipe is accompanied by a beautiful photo and a story about how the recipe came to be. I have a feeling that this book will become a nightstand addition in order to work my way through the 384 pages and savor each region's bounty each night. Recipes that especially caught my eye and that I tagged to make include Potato Gnocchi with Fontina Sauce from Valle d'Aosta, Warm Anchovy and Garlic Dipping Sauce from Piedmont, Chickpea Flour Pancake from Liguria, Bread Dumplings from Trentino-Alto Adige, Grilled Polenta with Whipped Salt Cod Spread from Veneto, Barley and Bean Soup from Friuli-Venezia Giulia, Stuffed Flatbreads from Emilia-Romagna, Tuscan White Bean Soup from Tuscany, Vegetable and Farro Soup from Umbria, Fried Stuffed Olives from Le Marche, Roman Gnocchi from Lazio, Linguine with Seafood from Abruzzo & Molise, Lemon Sorbet from Campania, Tomato and Burrata Salad with Pangrattato and Basil from Puglia, Fiery Macaroni from Basilicata, Grilled Swordfish with Salmoriglio Sauce from Calabria, Tuna with Sweet and Sour Onions from Sicily, and Fried Zucchini from Sardinia. Lest you think the book is all vegetable, fish and seafood dishes (what I eat), there are plenty of recipes featuring chicken, pork, lamb, and beef such as Chicken Under a Brick, Milk-Braised Pork Roast, Orecchiette with Sausage and Cream, Grilled Steak with Olive Oil and Lemon, Braised Oxtails, Chitarra Pasta with Lamb Ragu, and Braised Savoy Cabbage with Pancetta to name a few. 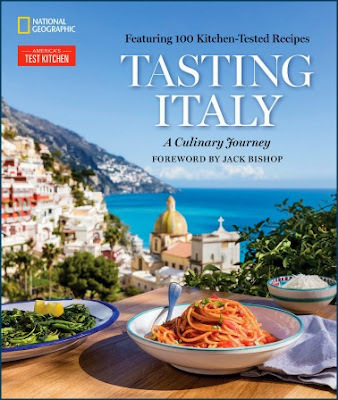 Tasting Italy would make a wonderful holiday gift and is a book that will be equally adored by Italophiles, cooks, foodies, travel junkies, and armchair travelers alike. I have not had the pleasure of going to Italy (yet), but Tasting Italy makes me want to book a trip there. The books were delayed in getting to us so I managed to cook just one recipe from Tasting Italy, but what a recipe it is, a gorgeous bowl of golden-hued Saffron Risotto (Risotto Alla Milanese) from Lombardy. Lombardy, in Northern Italy is right under Switzerland and is considered "the industrial heart of Italy" with Milan, the regions capital, being the heart of the country's fashion scene. Lombardy is also one Italy's largest agricultural areas with its combination of mountains, plains and plentiful water. Meat and dairy are prevalent in the region and mascarpone cheese and bresaola (dried beef) originate from there. With its plains of of wheat, corn, buckwheat and rice, polenta and rice are more common than pasta, which only became popular after World War II. There are abundant fruit and vegetables grown there such as melons, pears, apples, asparagus, and pumpkins. 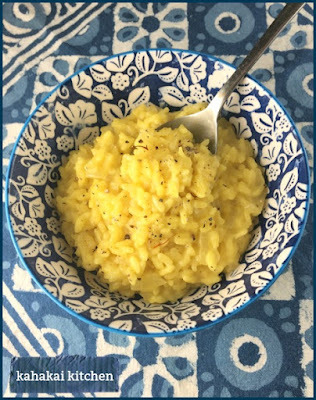 For me the Saffron Risotto cried out most to be made. Simple but luxurious and flavored with exotic saffron, the dish is often served on its own as a primo, or used to accompany a platter of Osso Buco (Braised Veal Shanks). 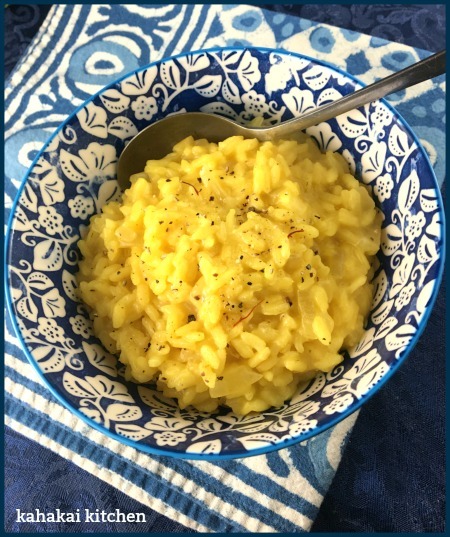 I love risotto and have about twenty recipes on the blog. I also had the last of a small bottle of saffron that a friend brought me from Spain to use, along with the Carnaroli rice called for in the recipe from the gourmet section of my local grocery store (although the book indicates that Aborio rice can also be substituted). Tasting Italy notes: "The dish's origin is a subject for debate. One legend claims that it was invented in the 1500s by a Milanese glassmaker who earned the nickname 'Zafferano' because he used saffron often to make gold stain. When he was jokingly challenged to add it to risotto, he did! However, the recipe's first appearance in an Italian cookbook wasn't until the 1800s. Perhaps it originated form Milan's ties to Spain, or a Milanese affinity for the golden color, or possibly the idea that saffron was beneficial to health." Bring both broth and water to simmer in medium saucepan. Cover and keep warm over low heat. Melt butter in Dutch oven over medium heat. Add onion and 1/2 teaspoon salt and cook until softened, about 5 minutes. Add rice and saffron and cook, stirring frequently, until grain edges begin to turn translucent, about 5 minutes. Add wine and cook, stirring frequently, until fully absorbed, about 2 minutes. Stir in 3 1/2 cups warm broth, bring to simmer, and cook, stirring occasionally, until almost fully absorbed, 10 to 12 minutes. Continue to cook rice, stirring frequently and adding warm broth, 1 cup at a time, every few minutes as liquid is absorbed, until rice is creamy and cooked through but still somewhat firm in center, 14 to 18 minutes. Remove pot from heat, cover and let sit for 5 minutes. Asjust consistency with remaining broth as needed (you may have broth left over). Stir in Parmigiano and season with salt and pepper to taste before serving. Notes/Results: So creamy, rich and delicious and you can't help but smile at the sunny golden color. The saffron is fully present in the flavor but the wine and Parmigiano Reggiano cheese add to the complexity of taste. I'm not used to adding so much of the liquid at the beginning (3 1/2 cups of the broth mixture) but it worked beautifully and toasting the saffron (and the onion) in the butter broke up the threads of the saffron releasing the color and flavor throughout the rice--it also adds to the richness of the dish. I was content to spend some time stirring the rice (it was my zen moment to recover from a busy day) until it reached it's maximum creaminess while still having a slight firmness, then curling up on the couch with a bowl of the deliciousness while watching the election returns. I would happily make this recipe again. 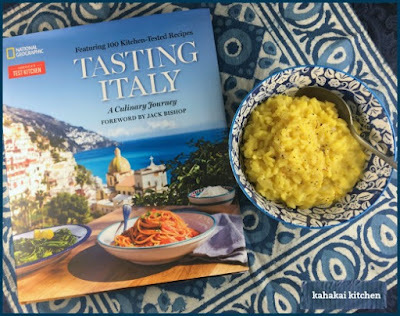 Tasting Italy is my tenth foodie book entry for the Foodies Read 2018 event. You can check out the November 2018 Foodies Read linkup, hosted by Heather at Based on a True Story, to see what everyone is reading this month. 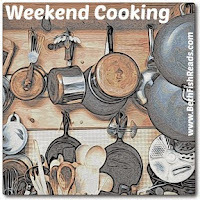 I'm sharing this post with the Weekend Cooking event at Beth Fish Reads, a weekly event that is open to anyone who has any kind of food-related post to share. For more information, see the welcome post. Note: A review copy of "Tasting Italy" was provided to me by the author and the publisher via TLC Book Tours. I was not compensated for this review and as always, my thoughts and opinions are my own. You can see the stops for the rest of this TLC Book Tour and what other reviewers thought about the book here. Deb, I am totally lusting after that book! Looks and sounds gorgeous. Thanks for being on the tour! There are so many recipes in this book that I want to try! That looks like a very interesting parallel to Samin Nosrat's new travel and food series on Netflix. Her first episode was Italy, with visits to a parmesan cheese maker, olive oil press, pork producer and butcher, and family cook. As you say, how could your combination of America's Test Kitchen and NatGeo go wrong! Great review, Deb. This book would make a great holiday gift. 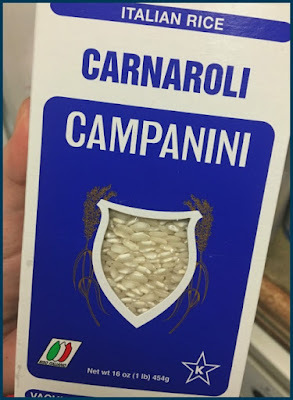 Glad you were able to whip up the risotto! Wow this really does sound like a great book. And I like Jack Bishop, so his name (as intro writer) is a bonus!